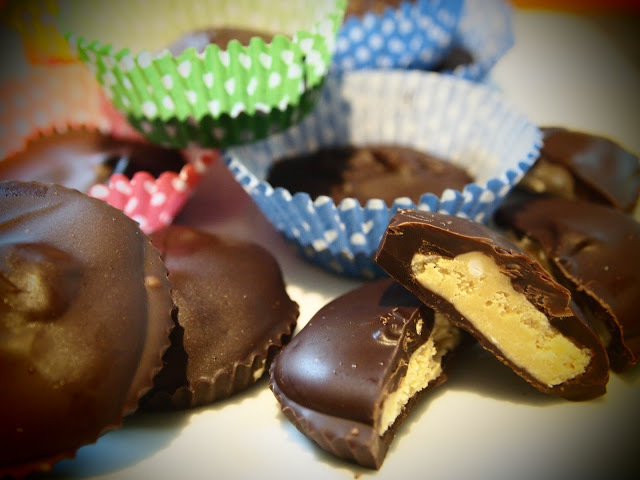 I wanted to recreate some delicious peanut butter cups, as they are a favourite in our house! Place the peanut butter, butter and salt in a microwaveable bowl, and heat in the microwave for about 30secs or just until soft, but not melted (check and stir the ingredients every 10 seconds). Stir in the icing sugar. Melt the chocolate in a bain marie, stir occasionally until melted. I added salt to this as well! Spread out 20 cupcake paper cases. Drop a teaspoon of the melted chocolate into each of the paper cases and spread to cover the bottom. Top with a teaspoon of peanut butter mixture. Then top with another spoonful of melted chocolate, making sure it evenly covers the edges and all of the peanut butter mixture. Let them set on the worktop, so that chocolate stays shiny and glossy, then store in an airtight container in the refrigerator. Gallery | This entry was posted in Recipes / Food and tagged Butter, Chocolate, Chocolate Peanut Butter, Food, Peanut, Peanut Butter, Peanut Butter Cups, Recipe, Sweets. Bookmark the permalink. Darn it! Now I wanna make these too!! You should, they are a yummy treat!